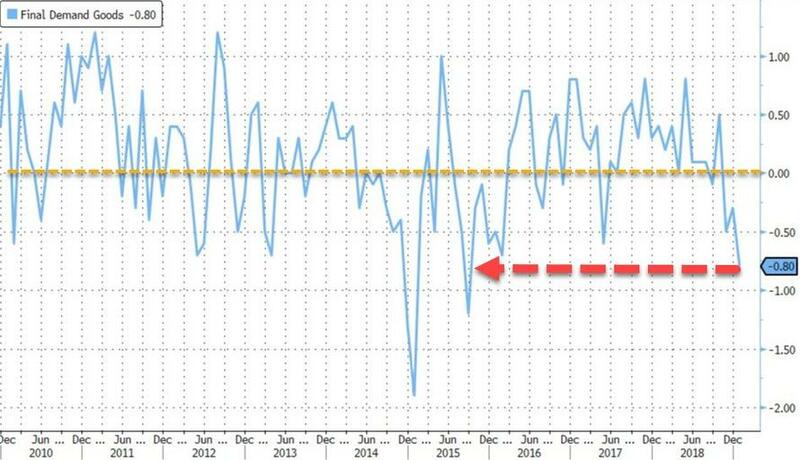 Just in case the worst retail sales print since 2009 wasn't enough, moments ago the BLS also reported that producer prices in January printed at -0.1% M/M, unchanged from December, and missing expectations of a rebound to 0.1%. 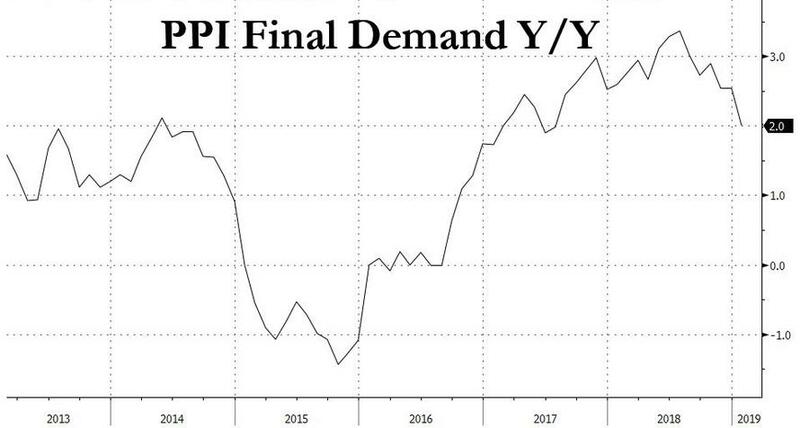 On an unadjusted annual basis, headline PPI final demand rose just 2.0%, the weakest print since mid-2017. The reason for the big miss, just like in yesterday's disappointing CPI print, was the sharp drop in energy prices: as a result, the index for final demand goods fell 0.8 percent in January, the biggest drop since it slid 1.2% in September 2015. As the BLS notes, over three-quarters of the January decline can be traced to prices for final demand energy, which tumbled 3.8%. The index for final demand foods fell 1.7 percent. Conversely, prices for final demand goods less foods and energy climbed 0.3 percent. Just as concerning is that the annual increase in Finished Goods prices is now rapidly approaching deflation territory. Some more details: 40% of the decrease in the index for final demand goods is attributable to a 7.3% decline in gasoline prices. It wasn't just energy: the indexes for fresh and dry vegetables, diesel fuel, fresh fruits and melons, basic organic chemicals, and jet fuel also moved lower. In contrast, prices for construction machinery and equipment rose 1.7 percent. The indexes for processed poultry and residential electric power also increased. 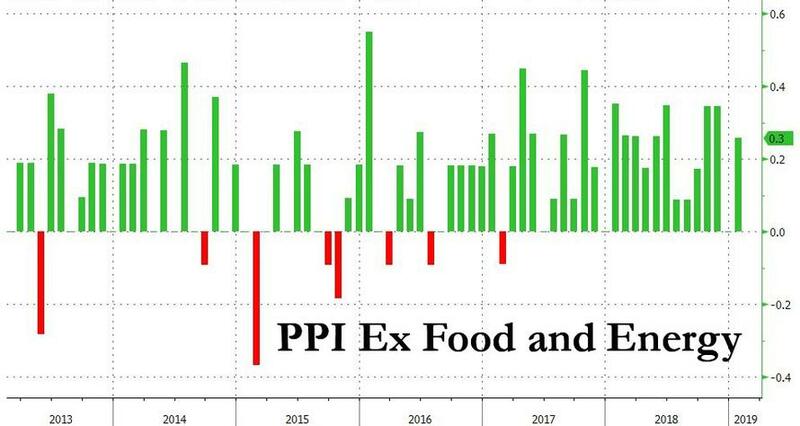 The picture was somewhat better in the PPI ex food and energy category which actually improved from 0.0% in Dec to 0.3% M/M in January, beating expectations of a 0.2% print. Similarly, on an annual basis, final demand ex food, energy rose 2.6%, better than the 2.5% estimate. There was no such weakness in the index for final demand services which rose 0.3% in January following no change in December. Over 80% of the rise can be traced to margins for final demand trade services, which increased 0.8%. (Trade indexes measure changes in margins received by wholesalers and retailers.) Prices for final demand transportation and warehousing services climbed 0.5 percent. 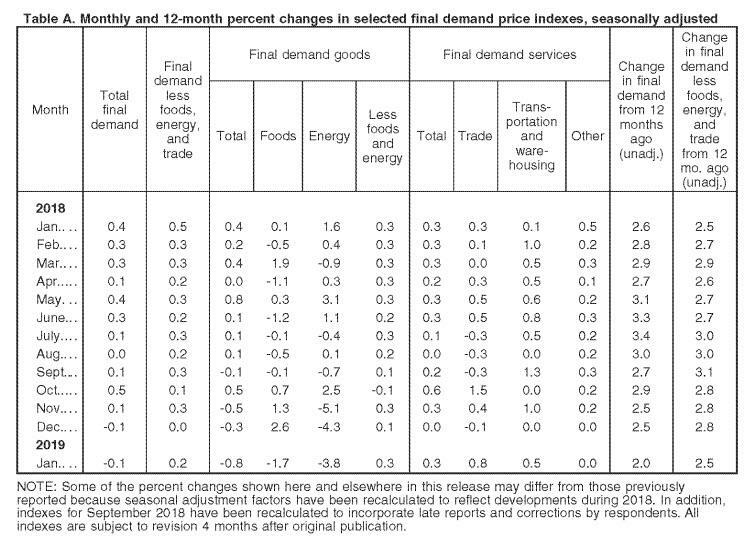 The index for final demand services less trade, transportation, and warehousing was unchanged. Half of the advance in prices for final demand services is attributable to margins for apparel, jewelry, footwear, and accessories retailing, which rose 6.3 percent. The indexes for health, beauty, and optical goods retailing; machinery, equipment, parts, and supplies wholesaling; chemicals and allied products wholesaling; hospital inpatient care; and transportation of passengers (partial) also moved higher. Conversely, prices for portfolio management fell 5.2 percent. The indexes for automotive fuels and lubricants retailing and for physician care also decreased. And so, between the disastrous retail sales number, yesterday's disappointing CPI print and today's shaky wholesale producer report, it is safe to say the Fed is done hiking for a long, long time.